UFO SIGHTINGS DAILY: This Day In UFO History: June 24, 1947 Kenneth Arnold Spots 9 UFO At Mt. Rainier, Washington, UFO Sighting News. 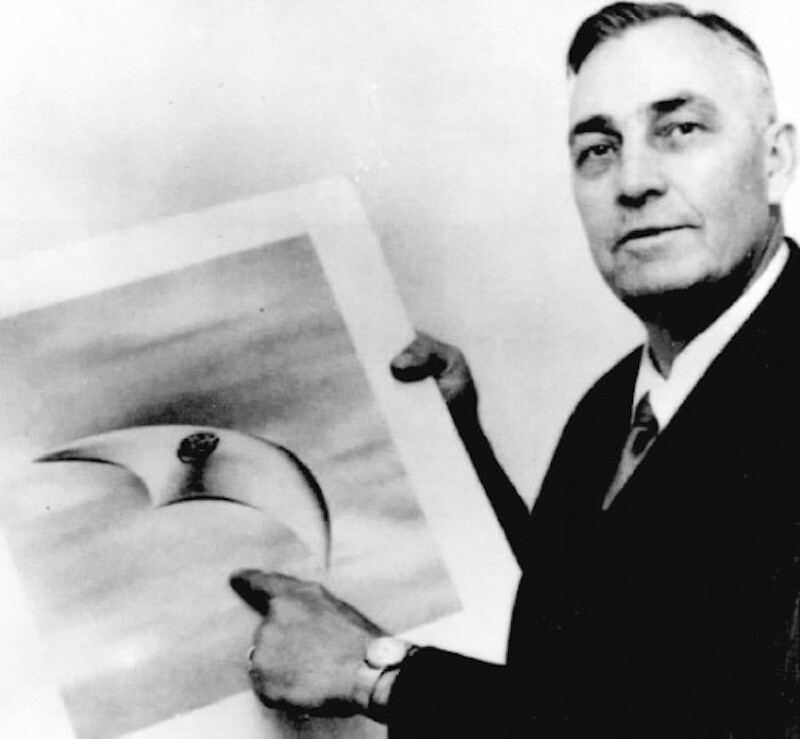 This Day In UFO History: June 24, 1947 Kenneth Arnold Spots 9 UFO At Mt. Rainier, Washington, UFO Sighting News. Funny how your life can get turned upside down just because you see something. Kenneth Arnold's story is the story of a pretty straight guy. He was an Eagle Scout when he was a teen-ager. He worked for the Red Cross. He was an All-State football player in high school, with hopes of being a college star until a knee injury cut his football career short. After college, Arnold became a salesman and learned to fly, combining the two by flying from small town to small town selling fire control equipment, eventually owning the Great Western Fire Control Supply Company. He was a member of the Sheriff's "aerial posse"of Ada County, Idaho, he was a relief U.S. Marshall, and he sometimes flew prisoners to the Federal Penitentiary. Flying his light plane, a Callair, was the basis of his livelihood. In other words, he was the perfect UFO witness: a solid citizen, honest and trustworthy, married, with two daughters. On June 24, 1947, he was returning home from a business trip when he made a detour into the Yakima, Washington area to help in an aerial search for a missing C-46 marine transport plane that was believed to have gone down in the area. At around 3:00 in the afternoon, he was flying at about 9,000 feet, near Mount Rainier, when a flash of light caught his eye. He turned and saw a procession of nine very strange objects flying from north to south in front of his plane. They were flat and rather heel-shaped, very shiny, and they moved erratically, like a "saucer would if you skipped it across water." You can see Arnold's drawing of what he saw here. Arnold estimated their size at about two-thirds that of a DC-4, and he calculated their speed at over 1500 mph by timing their travel between two mountain peaks of known distance. 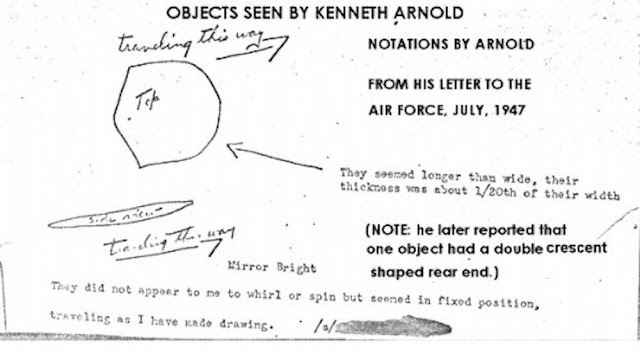 When he arrived at Yakima, Washington, Arnold told several other pilots about his sighting. The consensus among them was that it was some type of military "secret weapon". However, Arnold would later find that the U.S. military was as mystified by the objects as he himself was. In Pendleton, Oregon, Arnold went to make a report to the FBI, but the local office was closed, so he talked to the editor of the East Oregonian newspaper instead and it was the editor who put the story on the newswires. Because of Arnold's background and reliability as a witness, the story got wide circulation. Here's Arnold's report in his own words. What did Arnold see? Skeptics said everything from clouds to blowing snow on the mountain, to droplets of water on his airplane window. Here Martin Kottmeter shoots down some of the early theories of what Arnold saw. More recent explanations include Phil Klass' meteorite fragments and James Easton's white pelicans. 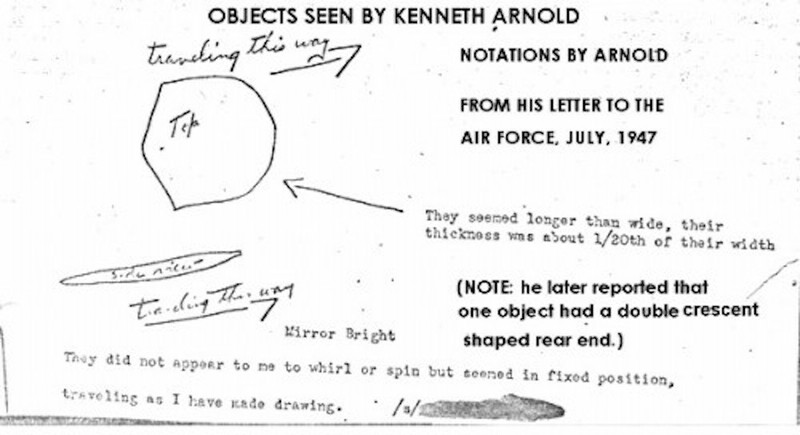 The June sighting and the resulting hoopla were not the end of Arnold's association with UFOs. 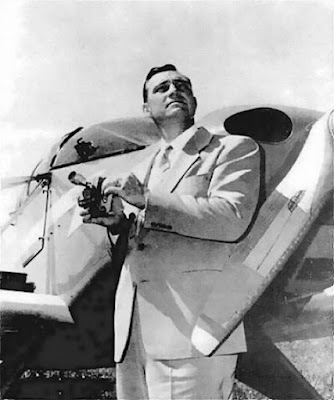 On July 5th, 1947, Arnold was introduced to Captain E. J. Smith, who, along with his co-pilot and a stewardess, had seen a formation of UFOs over Emmett, Idaho. They hit it off well and became good friends. 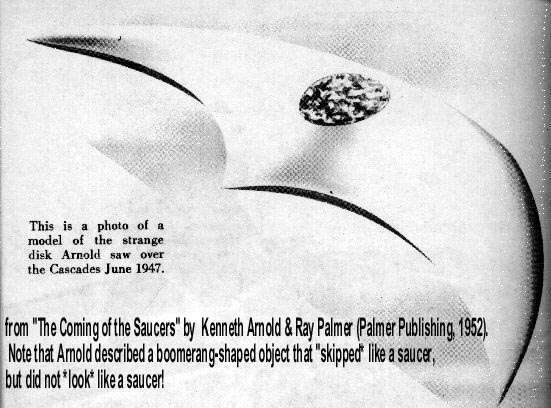 In the middle of July, Arnold received a letter from Raymond Palmer, editor of the pulp magazine Amazing Stories. Arnold didn't know who Palmer was, since he didn't read the pulps. Palmer wanted Arnold to write down his experiences for publication in the magazine and he offered to pay. Arnold didn't particularly care about the money and sent Palmer a copy of what he had already told the newspapers and the Army Air Corps. Later in July, a couple of Army Air Force intelligence officers named Lt. Frank M. Brown and Capt. William Davidson had a friendly meeting with Arnold. He gave them an account of his sighting and they asked him to report any further incidents to them. Lt. Brown filed a report giving his impression of Arnold's story.